Weber State big man Joel Bolomboy works out in preparation for the 2016 NBA Draft in Chicago. The Weber State senior put together a solid two-day camp as he excelled in a lot of the same ways that helped him become the 2016 Big Sky Player of the Year. As he did in college, Bolomboy manned the boards on both ends of the floor showing impressive pursuit despite not having the best overall basketball instincts. His main value at the NBA level is as an energy rebounder and he continued to show that skill can translate against better competition. Offensively, Bolomboy was a bit of a mixed bag. While he knocked down a trail jumper (foot on the 3-point line) with solid elevation and can make occasional shots from the perimeter, he's by no means a shooter'. That aspect of his game is a bit underrated and has potential to grow, but he has somewhat of a hitch and shoots on the way down at times. He'll have to continue fine-tuning his stroke to turn it into a reliable weapon. He struggles a bit to make quick decisions on pick and pops and isn't all that comfortable attacking a closeout as he's a bit mechanical in his movements. He did show value as a roll man as he finished a couple of times acrobatically with his left hand out of ball screens. Bolomboy also finished a tip dunk in traffic. On the defensive end, Bolomboy proved that he still has some work to do in terms of awareness and timing. He's by no means a stiff and does a great job ending possessions with defensive boards, but he isn't a natural rim protector in terms of instincts and doesn't quite have the size and length to make up for it. Bolomboy isn't an overly polished prospect and that certainly showed on Thursday and Friday, but he has a couple of skills that he can hang his hat on and could potentially hear his name called in second of the 2016 NBA Draft. A once unheralded high school recruit, senior Joel Bolomboy was able to lead his Weber State team to the NCAA Tournament for the second time in his career. He racked up individual accolades as well, by being named the Big Sky Conference's Player of the Year and Defensive Player of the Year. Bolomboy shouldered a much bigger share of Weber State's offense this season, seeing his usage rate rise significantly, but still managed to improve his efficiency, as well as his defensive rebounding numbers. Bolomboy has progressed as a draft prospect since we started tracking him after his sophomore season. He has developed physically and remains one of the top athletic big men in the country, filling out his 6'9 frame nicely. He hasn't made dramatic strides in his skill-level, but has improved enough to keep his name on draft radars. Offensively, Bolomboy was mainly a back to the basket threat for Weber State, with post-ups accounting for 34.5% of his possessions logged by Synergy Sports Technology. He found a good amount of success with this part of his game this season, scoring well over a point per possession in these situations. While able to assert his will regularly on low-major competition with his terrific frame, it is difficult to see a NBA team dumping the ball into the post and asking him to play one on one. He'll need to continue to work on his skill-level, as his footwork and countermoves are fairly rudimentary, and he struggles when he can't simply overpower opponents. He has become more of a willing and capable passer in his senior season and while he is still not stuffing the stat sheet with assists, he has seen his assist percentage rise from a paltry 5.9% as a junior to a more acceptable (but still not extraordinary) 7.9% as a senior. While his feel for the game seems to be improving gradually, he still has a tendency to miss open teammates. His passes seem to be more of a creation of going through his checkdowns then displaying any measure of vision in the post. He has a tendency to be robotic with his passes with many of his kickouts going to the man closest to him or to the opposite corner, so while this has helped create open opportunities, he still misses open cutters through the paint or on the baseline, as he doesn't have the vision to see the whole floor. His turnover rate also fell this season, from a sky-high 20.2% as a junior to a more manageable 17.1% as a senior. His passes aren't always on target and his footwork isn't strong in his face-up game, which leads to traveling violations. He hasn't improved much in reading the defense, often making his move right into the teeth of a double team or too close to the baseline. While he won't be asked to be an offensive creator at the next level, NBA teams may point to these struggles when questioning his feel for the game after four college seasons. Where he excels offensively is roaming the baseline and looking for dump-off passes or offensive rebounds he can dunk. He is an above the rim player with explosive leaping ability and a quick second jump to help him convert offensive rebounds. He's an elite finisher around the rim, converting 69% of his half-court attempts inside the paint according to Synergy Sports Technology, and 71% of his transition opportunities. He moves well from side to side and if he can show he can find the open passing lanes to receive passes off penetration, his offensive role becomes clearer. Although Weber State didn't use him in pick and rolls on a regular basis, he was showcased in this role often enough for him to show his potential. He has a decent feel as to when to roll to the rim and when to pop out for a jump shot, but that decision making process still has room to improve. His jump shooting ability may be one of the most intriguing parts of his game, although it's still unclear whether he can become a reliable jump shooter at the next level. Bolomboy didn't start shooting jumpers until his junior season, and finished his career a respectable 36/97 (37%) from beyond the arc, which is a small sample size even when just considering the past two years. He has the confidence to shoot from the outside, but his form is holding him back from becoming an even more consistent shooter. He has a hitch at the top of his shot that affects his release point, and without some overhaul to his mechanics, it is difficult to see him stretching defenses at the NBA level. Bolomboy obviously has some touch, though, so with more work in the gym and improved mechanics, this could become a more consistent part of his repertoire, which would be huge for his chances of sticking in the league long term. Defensively, Bolomboy has significant potential, but is still somewhat of a work in progress. He doesn't always make the impact you would like him to considering his tremendous physical tools, as his defensive awareness is below average, especially for a senior. He can be a step slow to rotate over to help his teammates or will get screened too easily. Despite his quickness, explosiveness and length, he blocked only 1.4 shots per 40 minutes pace adjusted, which is concerning at the level of competition he played at. With that said, Bolomboy's combination of strength, quickness, length and explosiveness, combined with his motor, is a very interesting combination, one that isn't that easy to come by these days. He'll have a lot of ground to cover early in his career to get up to snuff of NBA rotations and concepts, but if he's willing to put the work in, and receives the proper instruction, you can't rule out him picking things up, since there are no questions about his work ethic. Bolomboy does have one specific skill that could very well earn him a spot on a NBA roster. He is the best defensive rebounder among power forwards in our top 100 prospect rankings at 11.5 per 40 minutes pace adjusted. He combines very good instincts for pursuing loose balls with terrific physical tools, and has a huge competitive streak for throwing his body around with reckless abandon. Bolomboy is the type of competitive, athletic and high character big man NBA teams typically covet off the bench, even if there are some concerns about his basketball IQ and offensive limitations. Making the jump from the Big Sky conference to the NBA, he will have to show he can adjust to the speed and intricacies of the game. His physical tools will give him a chance to showcase his potential in the pre-draft process and if he can address those concerns, he'll have a better chance of hearing his name called come draft time. Weber State big man Joel Bolomboy (#73) hasn't played a single NCAA Tournament team all season besides Summit League champions South Dakota State. With all due respect to the Jackrabbits, NBA scouts will be anxious to see how the physically gifted big man looks against pro-caliber, athletic big men like the ones Xavier can throw at him. 6'10, 23-year old Jalen Reynolds is a physical specimen who should serve as an excellent test for the Big Sky Player of the Year. A lightly recruited high school prospect out of the Dallas/Fort Worth area, Joel Bolomboy committed to Weber State as 6-7, 200 pound raw big man. He had offers from some bigger conference schools, such as New Mexico, Fresno State and Missouri State, but decided to head to the Big Sky in part due to the fact that Weber State was the first school to start recruiting him, when he was only a sophomore. Bolomboy has a very unique background, as his mother is from Russia, his father from the Congo, and he was born in Kyiv (Ukraine), only to move to the States when he was 3 years old. He has grown into his frame substantially, and currently possesses tremendous physical attributes by any standard of college basketball, standing 6-9, with a very long wingspan, a great frame and outstanding athletic ability. He runs the floor well, can play above the rim with ease, and is extremely quick off his feet, giving him nice upside to grow into as his skill-level catches up. Bolomboy stepped into immediate playing time as a freshman, averaging 22 minutes per game, and responded by hauling in an impressive 13 rebounds per-40 minutes. He only scored around 12 points per-40 his first two seasons at Weber State, but saw that jump up to 15.8 as a junior, even if his efficiency took a hit, as he posted just a 47% 2-point percentage. At the Big Sky conference level, Bolomboy sees quite a few touches operating with his back to the basket, which likely won't be the case at the pro level. He's improved his ability to operate in the post over the years, as he draws fouls at a nice rate and finishes an impressive 53% of the field goal attempts he's able to get off in these situations, but is incredibly turnover prone, coughing the ball up on a sky high 26% of his possessions. NBA teams will want to see Bolomboy show better passing ability and overall decision making skills as a senior, as his 5.9% assist percentage and 20.2% turnover percentage leave a lot to be desired. His -6.46 pure point ratio was the third worst rate of any collegiate prospect in our Top-100, and shows just how much room he has to improve on his awareness and feel for the game. He is somewhat of a black hole when asked to make decisions with the ball, often settling for first shot he can even remotely get off, which also partially helps explain his underwhelming 2-point percentage. Part of that is due to the role he's asked to play for Weber State, which includes quite a bit of creating and shooting off the dribble. This is likely very different than the one he'll be asked to at the pro level, as he'll have better players around him and can focus on the things he does really well, which is run the floor, grab offensive rebounds, and finish emphatically around the basket off cuts and pick and rolls. Weber State's offense ranked 258th in the nation last year according to KenPom, and just 8th best in the Big Sky. Being forced to play as much one on one basketball as he currently does may help his skill-development in the long term, but it certainly doesn't help his efficiency. Very few of the shots he took as a junior were high-percentage looks, and he appeared downright wild at times with some of the things he tries to do. Interestingly, the freedom that Bolomboy enjoyed offensively allowed him to show better shooting range than many would suspect. He started to shoot 3-pointers last season and connected on an intriguing 15/41 attempts. This is a small (but not tiny) sample size, but is certainly something NBA scouts will want to monitor to see if he can continue to build on this part of his game, as it could alleviate some of the positional concerns teams might have if he can legitimately develop into a floor spacing. Bolomboy does not possess the most fluid looking shooting stroke from the waist up, as he seems to have a bit of a hitch in his jumper, sometimes holding onto the ball too long. Still, he is a career 72% free throw shooter, so clearly he has some natural touch that may serve him well if he can continue to improve on his mechanics. He tends to shoot the ball in unorthodox fashion, with two hands and from well in front of his face, sometimes elevating high off the ground and releasing it on the way down, which results in a very flat trajectory. It does go in a decent amount, even off the dribble at times, at least enough to leave some room for optimism regarding the future. Defensively, Bolomboy has significant potential with his outstanding combination of length and athleticism. Unfortunately, much of that potential is largely unrealized at the moment, as his awareness and fundamentals leave a lot to be desired on this of the floor. While Bolomboy has a nice frame, he is prone to giving up deep post-position and getting backed down by stronger centers inside the paint. On the perimeter, he lacks a degree of savvy and discipline trying to stay in front of quicker power forwards, as he tends to lose focus and get out of his stance quickly, causing him to get beat off the dribble far more often than you'd hope. While he is extremely athletic, that doesn't really show up in the stat sheet, as he generated just .7 steals and 1.9 blocks, as he's often a step slow with his reaction-time here. As somewhat of a late bloomer, teams will want to see what kind of strides he makes with his awareness and overall feel for the game as a senior, as his defensive potential is a huge part of his proposition as an energetic role-player. Likewise, it will be interesting to see how his rebounding numbers bounce back, as he went from being one of the best glass-cleaners in all of college basketball as a sophomore (15.1 per-40) to just a very good one (12.2) as a junior. Coming off a disappointing 13-17 campaign, culminated with a first round exit in the Big Sky Conference Tournament, Weber State returns a very experienced team, and was picked as the early favorites by Big Sky media. With precious few opportunities to match up against other high major schools (Utah State, BYU) on the schedule, making the NCAA Tournament once again could certainly help Bolomboy's exposure level. Nevertheless, after a very strong showing at the adidas Nations college counselor scrimmages this past August, Bolomboy is certain to garner plenty of invites to show how he stacks up against other elite NBA prospect big men during the pre-draft process. 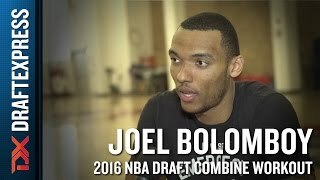 An interview with Weber State power forward Joel Bolomboy at the 2015 adidas Nations in Los Angeles. The Big Sky Defensive Player of the Year as a sophomore, Joel Bolomboy was invited to try out for Mike Fratello's Ukrainian National Team for the FIBA World Cup. However, a bone bruise forced him out of training, but will not be serious enough to cause him to miss time for Weber State. Bolomboy returns to the Wildcats fresh off a trip to the NCAA tournament and will look to lead them to a second straight appearance, despite losing their top two leading scorers to graduation in Davion Berry and Kyle Tresnak. Bolomboy's strengths come from his physical skill set, as he is an explosive, high-flying and quick 6'9 power forward. He has an impressive wingspan, but is still relatively thin, which causes him to be bullied by larger opponents in the paint. He moves around the court well and has a high motor to complement his physical tools. He has a nice combination of length and quickness, which means he could likely hold his own athletically in the NBA. Although Bolomboy has an impressive arsenal of athletic tools, his skill set hasn't quite caught up through his first two seasons. Bolomboy likes to post up but hasn't demonstrated the footwork needed to score on physically gifted defenders on a regular basis. He also isn't as physical as many players his size, which makes it difficult for him to gain position on the block. This forces him to start his moves from outside the paint, which leads to tough attempts. If he wants to become a better post scorer, he will need to get stronger and start playing more physically, while also improving his footwork. What Bolomboy brings to the table for NBA teams is elite rebounding skill. He averaged 4.9 offensive rebounds per 40 minutes pace adjusted last season and 9.9 defensive rebounds per 40 minutes pace adjusted, giving him a total of 14.8 per 40 minutes pace adjusted which ranked tied for third best among all collegiate players last season. He is committed to rebounding on both ends and uses his combination of physical tools to chase down loose balls all over the court. While he will likely need more than just rebounding to contribute at the next level, this skill is a nice one to build on as he works to impress NBA teams. When Bolomboy gets an offensive rebound, he is usually able to either finish or draw a foul. He converted 55.3% of his attempts around the rim, according to Synergy Sports Technology and was also able to shoot 5.9 free throws per 40 minutes pace adjusted, an impressive mark for a power forward . He needs to work more on finishing through contact, as his offensive rebounds and put-backs netted him only ten and-1 opportunities. Bolomboy didn't provide much offensive value outside the paint, which he will likely need to do both as a power forward and someone who may not be able to handle the physicality of most big men at the next level. He attempted only sixteen jump shots according to Synergy Sports Technology and looks uncomfortable shooting with his long arms. While he won't need to become a true stretch four, being able to knock down a mid-range jump shot will help him draw defenders away from the rim and provide further offensive value. Defensively, Bolomboy has the physical tools to be an impact defender, but struggled on this end of the floor last year against better competition. His court awareness and defensive IQ are below average, which puts him at a disadvantage from the start as he doesn't always see all of the action developing around him. He compounds this by not always being in a defensive stance, which takes away the impact of his physical skills, including his quickness, and leaves him vulnerable to dribble penetration. He only managed to provide 0.7 steals and 1.1 blocks per 40 minutes pace adjusted, very low numbers for a player of his length and quickness, particularly considering the competition he played against in the Big Sky. He did block 3.1 shots per 40 minutes pace adjusted as a freshman, so he did flash some potential in this area in the past. His lack of strength hurts him on this end as well, as he is easily backed down when guarding the post. Heading into this season, Bolomboy is a player to keep an eye on because of his physical tools and his rebounding ability. However, he will need to show some skill improvements as well as an increased ability to play physical, which he will need in order to succeed at the next level. Bolomboy has a ways to go before he becomes a legitimate draft prospect but he has a nice foundation to build on going into his junior season.